as most of the big things are taken care of, i have been focusing my efforts on details lately. the shoes are cole haan nike air, and i am pumped about them. (no pun intended). they will be dyed apple green, and adorned with a silk flower shoe clip (ordered but not yet arrived). 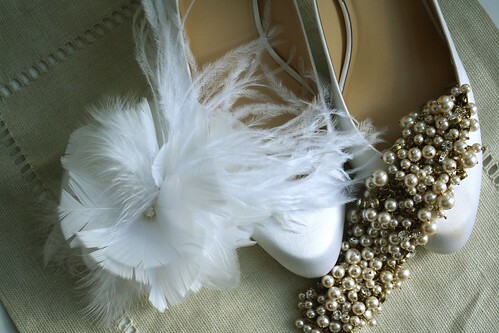 i felt comfortable with the investment of the shoes since i spent less than $800 on my dress. plus, i'll dye them black after the wedding and surely wear them to death. the hair fascinator is another etsy find. i love that it is handcrafted completely out of feathers. arbie was so wonderful to work with- customized my piece to my request and shipped it so quickly. (packaged in over-the-top loveliness, in true etsy fashion). lastly, the bracelet. an abundance of sparkly pearls and crystals, a la j.crew. a bit of an investment for such a piece, but i have no doubts that i will wear it frequently after the wedding. until then, it is off limits... although i do find myself sneaking a peek quite often. veil and necklace are up next. i will be wearing a bolero/wrap piece for the ceremony, and plan to switch to a fun necklace for the reception. i have been searching high and low for a piece that matches the sketch i have in my head, to no avail. think chunky, bubbly, sparkly, tons of pearls. got it? now add more pearls. that's what i want. send your ideas my way!